Home » Client vs. Customer – What’s the Difference? English is the primary language in several prominent Western capitalist societies, so it should come as no surprise that the language has multiple words for people who buy things. There is no shortage of goods and services available for purchase, but exactly what someone pays for is an important component of how we describe them. Client and customer are two words for individuals (or even groups or businesses) who pay for goods and services. Is there a meaningful difference between client and customer? In this post, I will compare client vs. customer. I will use each word in at least one example sentence, so you can see how it appears in context. Plus, I will show you a memory tool that you can use to make choosing client or customer much easier. What does client mean? The word client is a noun. A client is someone who engages the services of a professional. Attorneys and accountants have clients because people and businesses engage them for their legal and financial services, respectively. The firm fired one of its CPAs because her behavior caused them to lose an important client. Government officials were frustrated when the attorney refused to reveal information about his client. Like so many English words, client has origins in Latin, and came to English through French. English speakers have been using the word since at least the 14th century. What does customer mean? Customer is also a noun. It means someone who buys things from a store or business. When the customer tried to return her television at the register, the cashier directed her to customer service instead. The once popular tavern lost multitudes of customers when it replaced its cheap drinks and simple pub food with fancy cocktails and elevated dining options. In a literal sense, a customer is someone who gives custom, where custom is a somewhat archaic word for regular business. There is a bit of overlap between client and customer. A client is obviously buying the serviced of an attorney or accountant, so, in some sense, he or she is a “customer.” And customers can buy services instead of physical goods. In practice, client is usually reserved for someone who pays for highly specialized professional services, while customer describes someone who makes purchases at a store or other business, especially on a regular basis. Professionals like attorneys and accountants have clients. Retail stores like grocery stores and restaurants have customers. If you can remember that custom means regular business, it should be easy to remember that a customer is someone who regularly shops at stores or other businesses. Is it customer or client? The nouns client and customer both refer to people who purchase things. Traditionally, a client pays for highly specialized professional services, while a customer shops regularly at a store or other business. There is still some overlap between them, but careful writers use each word in its proper context. 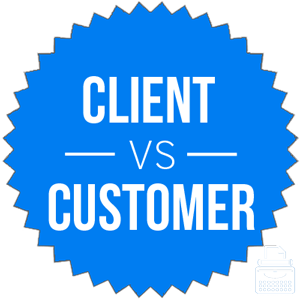 1 What is the Difference Between a Client and a Customer? Copywritten vs. Copyrighted – What’s the Difference?